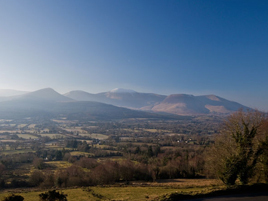 Right in the heart of the Golden Vale, the village of Dundrum is surrounded by forest and has a number of listed forest walks. There is a nearby Hotel, Dundrum House and Golf Club & Leisure Centre. 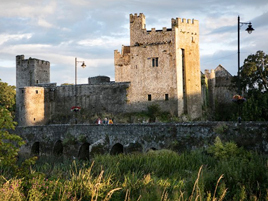 To the south is the town of Cahir, built around the 12th century Norman Cahir Castle, standing on a stony island on the River Suir, at the eastern side of the Galty Mountains. There are a number of good cafe’s and restaurants in the town. The Swiss Cottage is a short distance from the town in Cahir Park. There are many lovely walks in and around the town. To the West are the Galty Mountains with many guided walks for every level from beginner to advanced and short walks to suit children. The nearby Mitchelstown Cave is also of interest to children, comprised of 3 underground caverns with incredible drip formations. Click here for location of Cahir. Clonmel is a large town set in lovely Mountain Scenery. Nestling in the Comeragh Mountains with Slievenamon to the east and the Knockmealdowns to the South, it is a great place to shop, eat and explore the lovely countryside. 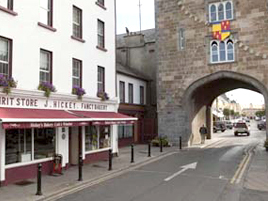 The Clonmel Heritage Trail takes in the main historical features of the town. Clonmel Racerourse is a short distance from town and garden lovers can visit nearby Killurney Garden. There are regular concerts, Theatre and exhibits at South Tipperary Arts Centre. The nearby town of Fethard has been a walled town since the 13th century and within those walls are many Churches, Friaries, towers and Sheela-na-Gig carvings. Click here for location of Clonmel. The beautiful Glen of Aherlow is a 16 mile stretch across some of Tipperary’s most breathtaking countryside. The River Aherlow flows through it, it is a very popular walking and horse trail through valleys and up to beautiful corrie lakes deep in the Galty Mountain range. The Glen of Aherlow is between the Galtys and Slievenamuck Ridge on the North. The Glen is a walking centre of excellence. Nearby villages are Galbally and Bansha. North of the Glen of Aherlow, Tipperary Town lies on the river Ara. The history of Tipperary, including its contribution in the War of Independence, can be accessed at the Tipperary Excel Heritage Centre in the town. A short trip outside the town to Limerick Junction is Tipperary Racecourse with flat racing and national hunt meetings. There is a golf course at the scenic Tipperary Golf Club and Ballykisteen Golf and Country Club.